Albert Charles Blozis was born January 5, 1919 in Garfield. After his family moved to Hudson County, Al attended Dickinson High School in Jersey City. He was the star of the track team, using his 6–6 230-pound frame to propel the shot put and discus eye-popping distances. The Dicksinson football squad made use of Al’s talents, too. 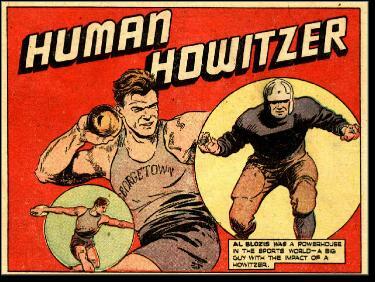 The team produced a steady stream of talent during the 1930s, including future NFL running back Joe Sulaitis and Ed Franco, one of Fordham’s Seven Blocks of Granite. Like Franco, Al played the line. Recruited primarily as a track athlete, Al accepted a scholarship to Georgetown and proceeded to rewrite the record books in the shot put. In 1941, he set a world indoor record with a throw of 56’ 4.5”. Al went on to become the national indoor and outdoor champ in 1942 and again in 1943. By this time, Al was a professional football player. Under tutelage of Hoya coaches (and ex-New York Giants)Jack Hagerty and Mickey Murtagh, he became a standout blocker. The coacheslater claimed Al would have been an All-American had he not missed two practices a week because of his lab work as a chemistry major. Al didn’t feel right about playing pro ball while others were fighting. He visited more than one enlistment station only to be turned away because he exceeded the military’s height limit. Finally, in December of 1943, he persuaded the Army to take him. Al began his military career as a physical instructor at Walter Reed Hospital in Washington DC. Like many well-known pro athletes, he was kept out of harm’s way and participated in various morale-building functions as part of his service. Later, Al was transferred to Ft. Benning in Georgia. There he set a record by throwing a hand grenade 94 yards. 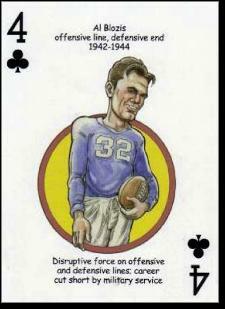 During 1944 he was able to get furloughs and play in three NFL games for the Giants. Al wasn’t happy as an instructor and lobbied to join the fighting in Europe. He was commissioned as a lieutenant and sent to France. In January of 1945, his platoon was in the Vosges Mountains, on the French-German border. When two of his men failed to return from a scouting mission, Al went after them alone. He was never seen alive again. Al’s bullet-riddled body wasn’t found until April.